ST. LOUIS, April 4, 2018 /PRNewswire/ -- With 2017 being among the most active hurricane seasons in history, countless people and pets were affected by natural disasters last year. Animals can be especially vulnerable during hurricanes, flooding and other natural disasters, leaving pet owners, pet shelters and others faced with difficult decisions and added hardships. The Humane Society of Broward County (HSBC) in Fort Lauderdale, Florida, was confronted with one such challenge in September as Hurricane Irma was barreling toward their state. With a shelter full of adoptable pets, and knowing that the pending hurricane would cause local pets to be separated from their owners, HSBC decided to move their shelter pets out of harm's way entirely – but that would come at a cost. 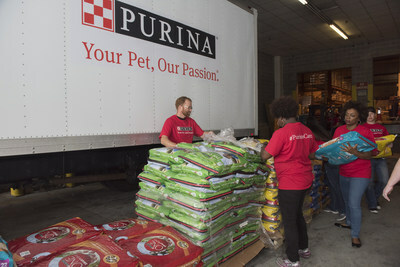 That's when Purina and GreaterGood.org stepped in to help. Supporting disaster relief efforts is a key area of focus for Purina, a leading manufacturer of high-quality pet products. Purina answered the call for help from HSBC and many other organizations in 2017 - the company's charitable donations last year totaled more than $28 million1 and included product donations and monetary funding for organizations that bring people and pets together, keep people and pets together and help communities and the environment thrive. Over the past four years, Purina has contributed $120 million toward these causes. In the wake of last summer's hurricanes, Purina donated 350,000 pounds of dog food, cat food and litter to GreaterGood.org to reach pets in need and provided monetary funding that supported immediate and ongoing rescue efforts for supplies and rebuilding initiatives. 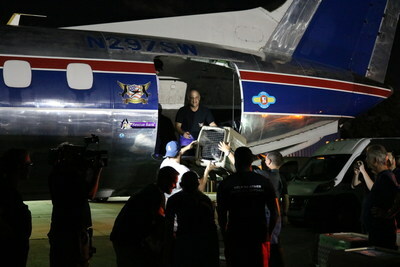 After hearing HSBC's story, a portion of that funding was allocated to help transport pets from HSBC to Walnut Creek, California-based Tony La Russa's Animal Rescue Foundation (ARF) via a private flight. "Thanks to all of these organizations coming together, ARF was able to successfully place 160 adoptable pets into new homes in the Bay Area, creating room at our shelter for those pets displaced by the storm and giving them a chance to be reunited with their local families," said Christopher Agostino, Executive Director, HSBC. "Pets contribute to our families in so many ways, and we're grateful for the support of our pet-loving friends across the country who worked together to keep pets safe." In addition to supporting disaster relief efforts, Purina's contributions reached pet rescue organizations, victims of domestic violence, and other community- and environment-related charities. "At Purina we know firsthand the bond that people share with their pets, which is why we're committed to supporting organizations that share in our mission to enrich the lives of pets and the people who love them," said Joseph Sivewright, Purina CEO. "Whether it's providing high-quality nutrition for shelter pets, helping to keep people and their pets together in times of crisis, or protecting the planet we all share, we're passionate about these causes and will continue supporting this important work in 2018 and beyond." Pet shelters and rescue organizations rely on the support of donations to keep their operations running smoothly and keep their dogs and cats healthy as they await their forever home. Purina supports HSBC, ARF and many other pet shelters and rescues with pet food and cat litter donations year-round, and in 2017, Purina donated more than 13 million pounds of pet food and cat litter to organizations across the United States. Through the Purina Shelter Champions partner program, Purina provides affordable nutrition and litter to more than 150,000 shelter pets across the United States. 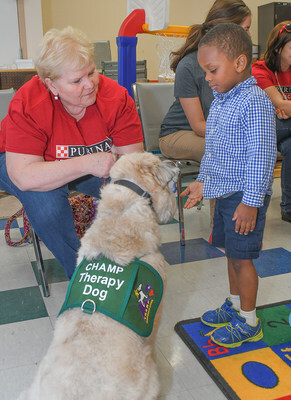 Beyond monetary and product support, Purina employees also spent thousands of hours getting involved in pet-related and other community causes through volunteerism. In 2017, Purina continued its support for the Urban Resource Institute (URI), a leading non-profit organization that operates domestic violence shelters in the New York City area and provides comprehensive social services that aid New Yorkers in times of crisis. URI and Purina have partnered since 2013 to expand the People and Animals Living Safely program that allows victims of domestic violence to enter shelters with their pets. Despite 48% of victims saying they wouldn't leave an unsafe situation out of fear of what would happen to their pet, only 3% of domestic violence shelters in the U.S. allow pets. Purina and the Urban Resource institute are looking to change that. "Domestic violence affects everyone in the household – pets included," said Nathaniel Fields, URI CEO. "Providing pathways for safety and recovery is the main focus for programs serving survivors of domestic abuse. Transitioning into life after domestic violence can be made a little easier when individuals and families can make the journey with the pets they love, and Purina has been a key partner in helping us do that." Purina donates pet food and pet supplies to help victims as they move into a URI shelter and also has provided the funds to build three Purina Pet Havens, secure areas at the shelter designed to provide a place where residents and their pets can unwind in peace. Purina and URI are also supporting the Pet and Women Safety (PAWS) Act on Capitol Hill to encourage allowing pets in more domestic violence shelters. Purina also advocates for a healthy planet and helped further the efforts of several organizations working to promote sustainable practices on agricultural lands where key ingredients are grown. A significant amount of funding was contributed for projects with organizations like The Nature Conservancy and Ducks Unlimited to support efficient use of today's natural resources to ensure a healthier future for pets and people alike.